I got one of the Smash GCN controllers, so I'll be using that. I still have my old set of GCN controllers (1 Wavebird, 3 wired) with a WiiU adapter, plus a wired Switch Pro & the default double Joy-Con. Unless I go to a tournament I'll just be using it in handheld mode. If I can play Street Fighter like that then this should be fine. 1) WORLD OF LIGHT: Just like in SSE, adding a character in-story automatically unlocks them. 2) VERSUS: Seems to track button input to make sure you're not just standing still to run the clock or jumping straight to your doom, & has a 5-min cooldown between unlocks (unless you cheat the timer by resetting the game). 3) CLASSIC: Each time you beat Classic with a different character, you'll face a different newcomer, until you start running out. No cooldown timer, but it typically takes more than 5 minutes to beat Classic anyway. My local Walmart had a free Ultimate tourney tonight; I placed 9th (out of 12). They used a shelf copy, not a prerelease edition, so most of the characters (including literally all of my mains) weren't unlocked yet. Got some Inkling practice in, though; I like they way they handle. ...Oh, by the way, do we have any Persona fans here? I think a lot of people didn't see that coming. BOIIIIIIIIIIIII JOKER AS DLC! WHATTTT??? Man, I was playing this game until 2AM. Unlocked Inkling and King K. Rool (aside from a couple other characters who were already in Smash). Beat Classic Mode on highest intensity. Man, I'm pumped. Huh, didn't see that coming. I guess that means Persona 5 is probably coming to Switch because that's pretty random. Huh, didn't see that coming. Versus-mode unlocks are random. As mentioned, I was playing Inkling, in large part because freaking Luigi wasn't available yet. If you lose an unlock match, an extra mode, Challenger's Approach, will periodically appear in the Games & More menu that will allow you to re-attempt the unlock. Roll fatigue really isn't that drastic. Tourney Mode offers multiple bracket options to accommodate however many players you have. Gonna pick up my copy after work today. Man I'm rusty, and I have to get used to my new control scheme. I started off sloppy, got better and then got atrocious. So I need to take a few hours break as with any new game. edit: Also I was so happy to see so many Smash 64 songs in My Music. Check out Battlefield for a few nice surprises. Last edited by X-3 on Fri Dec 07, 2018 4:37 pm, edited 1 time in total. After the Piranha Plant character announcement, I was sort of feeling ho-hum about the potential DLC character selection. Now I'm on board with a season pass. 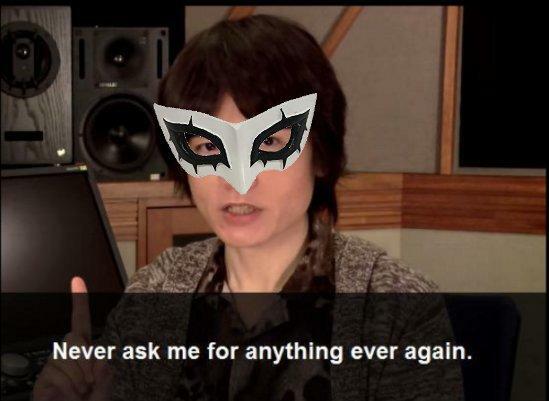 If "Rivers in the Desert" and "Blooming Villain" aren't part of the P5 stage, I may revert back to ho-hum. I was reading about the Persona DLC, and I saw someone demanding Goku be in the game for the billionth time and I almost clicked away from the discussion when I noticed someone say something really interesting that I didn't know. Someone gave the guy the usual "character's franchise must originate from gaming" line to shut him down when someone else reminded everyone that Shin Megami Tensei originated from a book before it was a game, and even had an OVA prior to the game adaptation of the book. I literally didn't even know Persona had anything to do with Shin Megami Tensei until right now. Was Joker in the books before he was in the games? I wish I could tell you, but I don't really know much about the series. There's tons of games and other media, but I've only beaten P3 & P4. Doesn't help that there's several spin-offs, and that the spin-offs have spin-offs... The Persona series seems to have dropped the "Shin Megami Tensei" part of their titles though, so it's easy to see why you didn't know they were connected. Persona is a spin-off series of SMT, a series that has become kind-of detached from the original Megami Tensei books. I say 'kind-of' because it's undeniable that the (mainline SMT) series still draws from MT a lot in a lot of ways as you can read from that synopsis, such as core stuff like summoning demons digitally. Regardless I'd say that it doesn't really affect Goku's chances...because Nintendo and Sakurai generally do whatever the hell they want. It's not like Shinzo Abe is going to step in and say, "wait there Nintendo, you can't add Anne of Green Gables!" Anyway, what were your starting Spirits and profile icons? I got Octoman when I started the game and my profile icon started at King Hippo.